If you are looking to run playtests with your own community of players then we have just the thing :). PlaytestCloud offers a subscription based service called Bring Your Own Players (BYOP), where you can use PlaytestCloud's products - but with your own testers! Testing with an active community of players that you have access to. In-house playtesting or participating in the playtest yourself, explained further in this article. Testing with players outside of the geographical limits of our database (United Kingdom, United States and Canada). To sign up, navigate to Settings > Subscriptions in your PlaytestCloud account where you can view the details and sign up for a 14-day free trial. Above are the the different plans we have on offer. 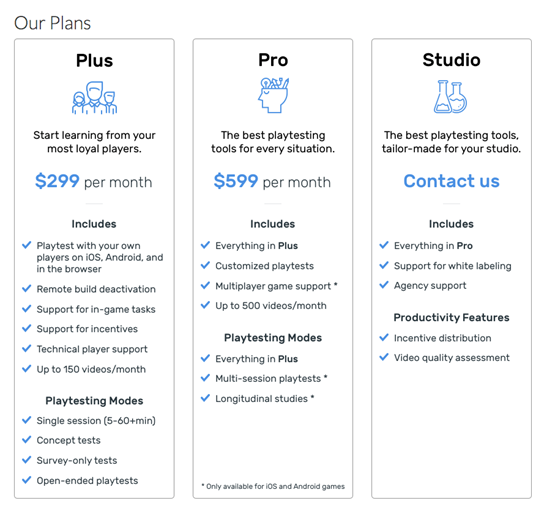 If you have a use case that is not covered in the Plus or Pro packages, please get in touch at hello@playtestcloud.com and we can design a package that suits you. 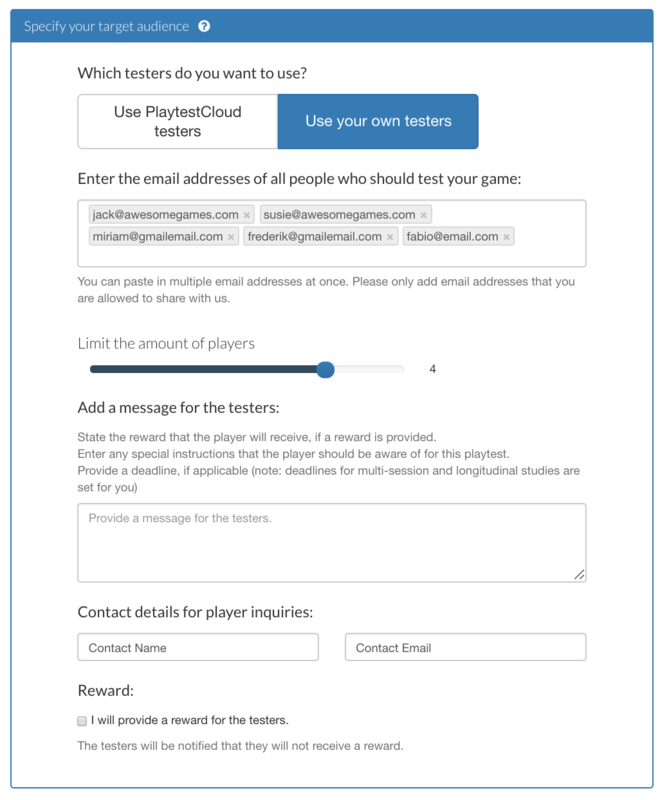 When BYOP is activated, you can order playtests as you normally would but rather than selecting PlaytestCloud's testers you can select 'Use your own testers' and input the email addresses of your players. Provide a contact detail for player enquiries (technical enquires will be directed to PlaytestCloud). We cannot enact quality control over the player videos like we normally would because the players are not part of our database. We do, however, provide a short briefing on their device before the playtest starts about best playtest practice. We do not handle the player rewards, the incentives will be organised and administered by you. To provide player rewards, check the box 'I will provide a reward for the testers' and please communicate and organize these rewards separately with the players. If you will not provide a player reward, please leave this blank and we will notify the players that there is no reward. Other than that, all of our other processes are still in place: we invite the players to the playtest, send them the game to playtest in our wrapped software, send reminder emails to the players, send you a results playtest page with the player videos etc. We recommend preparing the players beforehand about receiving the playtest from PlaytestCloud.